With a decades-long discography boasting more than 40 releases as a band leader (and another 50 or so as a sideman), author and Free Music legend Joe Morris has built a career out of doing exactly what he wants. Currently, the uncompromising Connecticut resident is making some absolutely astonishing noises with his improvisational trio, The Spanish Donkey. Completed by master drummer Mike Pride (whose paradigm-shifting percussion work includes collaborations with The Boredoms and Millions of Dead Cops) and organist/pianist Jamie Saft (Jamie Saft Trio/John Zorn/Bad Brains), The Spanish Donkey released issued RAOUL, their second album overall and first for the noted London-based experimental label RareNoise. 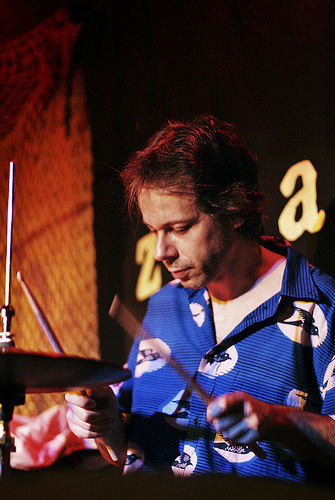 Composer and percussionist Lukas Ligeti will celebrate his 50th birthday with two nights of premieres: June 14th at Roulette, and June 11th at the Austrian Cultural Forum. The concert series opens June 11th at the ACFNY, with performances of Lukas’ solo and small ensemble works (performers include Thomas Bergeron, Candy Chiu, Jennifer Hymer, Ben Reimer, David Cossin, and others), and premiere pieces for Lukas’ new classical/indie rock band, Notebook. The festival culminates June 14th at Roulette featuring Lukas’ music for chamber orchestra. Program includes several world premieres, as well as U.S. and New York City premieres, performed by the fresh, contemporary-collective Ensemble mise-en conducted by Oliver Hagen, pianist Vicky Chow, and others. Recently, he took time to answer a few questions from AMN. You are a truly international composer and performer, in the sense that you have followings on at least three continents and have been influenced by the music thereof. How did you develop this global approach to music? My whole life story, even my family history, has predestined me to exist less in any specific culture than in the spaces between them. I was born in Austria to parents who had fled from Hungary. But, being jews, they were not entirely clearly Hungarians, either – not, at least, since having experienced the holocaust. Also, as an aside, my father [avant-garde composer Gyorgy Ligeti] grew up in what is now Romania. At birth, I was without citizenship, a Geneva Convention refugee who had never himself fled. I became an Austrian citizen and grew up in a country that was somewhat foreign to my parents. Having lived briefly in California and started elementary school there, I then returned to Austria and went to an American school there, growing up among expatriates from all over the world. I studied in Austria and eventually immigrated to the U.S.; now, I’m a dual citizen, with two citizenships acquired by naturalization. In the meantime, I began spending much time in Africa and started feeling very much at home there, initially in the Ivory Coast and Burkina Faso, and now also in South Africa, where I now have a second home. And in music, I started late and by listening to any style imaginable, so as opposed to most people, I don’t “come from” classical or jazz or whatever else. In particular, your recent work has been influenced by African music. How did you get introduced to the sounds of that continent? My first exposure to African culture was very unusual and not at all musical. My grandmother had a small but significant collection of African sculptures, which I fell in love with. Later, around the age of 20, I started listening to African music through a variety of coincidences: cassette-swapping with my father; a girlfriend who had grown up in Malawi; lectures by the ethnomusicologist Gerhard Kubik at the University of Vienna. The latter in particular provided some input that made me change my thinking about music completely, at a point when I was still very new to music and had few or no ingrained habits or beliefs. And this African music, initially particularly from Uganda, became a fundamental influence in my process of forming a voice of my own. Then, 7 or 8 years later, I started going to Africa, and my first trip there, an invitation by the Goethe Institute to the Ivory Coast, was similarly life-changing and embarked me on an ongoing path of collaborating with African musicians. The first time I heard your music was on the recording from the avant-jazz-rock group Kombinat M. You have gone from using a more traditional drum kit at that time to experimental electronic percussion today. What has driven this evolution? I still play a regular drum kit; my most recent gig the other day was playing straight-ahead jazz, and I much prefer the drums to electronics when I free-improvise. But I built myself a little computer back in high school and have been interested in electronics ever since. After practicing drums for a few years, I decided it was time to bring technology into the game, but I wanted to preserve / expand the technique I’d acquired rather than jettisoning it through electronics. I didn’t want my playing to become disembodied or static, or to just play a computer keyboard. I was interested to see how my drumming technique and my listening would change through electronics. I continue to play both traditional drum kit and electronic percussion. When you have some time off, what do you listen to? Are there any composers or musicians you have discovered recently? There are always new ones… at the moment I’m so busy preparing for my upcoming concerts that I don’t have a clear mind to say which are my most recent favorites. I listen to music from all over the world and from all stylistic orientations and time periods. How did your 50th birthday celebration performances come together? The Austrian Cultural Forum in New York had long wanted to do a feature on my work, and my 50th birthday seemed like a great opportunity. And for me it was a wonderful chance to present a wider cross-section of my classical compositions, something I don’t often get a chance to do. I’m not part of the mainstream, I guess, so many outlets for presenting work that welcome other composers seem to be closed to me. What else have you got coming up in 2015 with respect to releases and performances? My most important activity later this year will be a move to Southern California, where I’ll join the faculty in “Integrated Composition, Improvisation, and Technology” (ICIT), a new and innovative Ph.D program at the University of California, Irvine. I’m very excited to join one of the few academic programs in existence that have a truly experimental focus, open in all directions. Among other activities will be a repeat of my June 14 roulette concert in South Africa with musicians from there and a residency at the Museum of the History of Polish Jews in Warsaw to develop a site-specific piece. From the AngelicA label, a live cd compilation of two concerts that Christian Wolff, Robyn Schulkowsky and Apartment House held here in 2013, a cd recording of performance by Charlemagne Palestine on a non-tempered organ of a Bolognese church in 2004, a compilation of previously unreleased live track by Stefano Scodanibbio performing with Rohan de Saram, Bruce Ackley, Terry Riley, Frances-Marie Uitti and others, and two archive recordings (from early 90’s) of saxophonist Gianni Gebbia, respectively with Lindsay Cooper, Fred Frith and Lars Hollmer, and with Tiziano Popoli and Massimo Simonini. On June 13, 2015 the Lost Civilizations experimental music project will join Oppo, HYFY and Rosewell at O’Shaughnessy’s (which is located at 1324 King Street in Old Town Alexandria. The Lost Civilizations experimental music project is a collaboration between Mike Sebastian (tenor sax, saxello and baritone sax) and T. A. Zook (basscello). Although essentially a duo, when schedules permit, it is joined by Jerry Busher (drums); Doug Kallmeyer (bass and electronics); Sam Lohman (drums); Larry Gomez (percussion), Patrick Whitehead (horns) and Emily Chimiak (violin). Sam Lohman will be sitting in at this performance. Oppo (AH-poe) is a new, high-energy indie rock trio made of strands of DC’s Gist, Petworth, and O’Tasty. Described as Dinosaur Jr. meets GBV meets MBV meets Afghan Whigs meets Weezer meets Built To Spill meets Joni Mitchell, Oppo wrap plaintive melodies, textural guitars, and thumping rhythms around vignettes of moral crisis, redemption, and the invisible world of things beyond language and knowing. Rosewell is a five piece alternative rock band that originally formed as RADIOFEEDBAK in 2011. Rhythm guitarist Angel Gutarra first spearheaded the band with buddy, lead guitarist Steve Koehnke. HYFY has had something like 12 members over the years from bands including Bells & Hunters, Del Evelo, Straight up Tribal, Kino Musica, ShowPony, Albono Rhino (US), and others. In this current form HYFY promises to deliver a fine blend of jazz-inspired rock and funk. They seem to have a knack for quick songwriting, and free flowing jams, and most recently have been taking on covers from popular local acts. Experimental electric guitarist David Torn was touring to support his album only sky (ECM, 2015), a collection of solo performances done in real time using looping and other electronic processing. But there was no attempt to play selections from the recording: as Torn explained during the Q&A after the concert, all of the performances on the tour were completely improvised. Anyone who has followed Torn’s career should know to expect the unexpected! Secret Keeper record release tour, part two!